The current tragedy unfolding in the Middle East right now deserves a more powerful and direct response than I am prepared to deliver. The media coverage is very difficult to sift through and judge, as the reporting has been marinated in propaganda campaigns more sophisticated than anything I have personally experienced. Many people I talk to seem to be unwittingly “on message”, faithfully echoing the sound bites they have been fed on a steady basis. I am connected to people with very deep convictions about this issue. I know this is a divisive wedge issue, but I am not sure how many social networks contain the extremes it feels like mine does. I have not found it productive to weigh in on the questions of morality and entitlement, but I have come across a few pieces that I think do a good job discussing the long term strategic stakes, from a more detached and rational perspective. I feel like I can more successfully engage staunch supporters of Israel by challenging the long term wisdom of these attacks, not their justification. Even Israeli newspapers and human rights groups are far more nuanced, vocal and divided than the homogenized dichotomy I am subjected to in the US. At times like these, I also return to read the wise Kabbalistic reflections of the Meru Foundation’s Stan Tenen and his series Making Peace with Geometry (and the recent How Mother Nature Keeps the Peace). Meanwhile, this is all occurring in an environment awash in participatory media, and I am trying to track the online tactics emerging around this showdown. This is a decent run-down on the cyber-debate the gaza conflict has precipitated. However, beyond the viral video games (newsgaming as the new political cartoon? Raid Gaza! ), facebook status updates (qussam count, support gaza), interactive visual propoganda, and virtual protests (which I predicted last year), there is something different happening that is really worth noting. Denial of Service attacks are pretty serious. If the infrastructure you are attacking runs mission critical services, like hospitals, airports, traffic lights, or whatever, suddenly you might actually be participating directly in the destruction, not just debating about it. It’s scary and important to recognize the dark side of collaboration – the side that leads to lynchings and mob justice. I have to wonder whether the constant visceral immersion in this carnage has anything to do with its spillover beyond the Mediterranean – NYC police officers have even been injured in this conflict. Update (11/28/09): I have learned that the World Flag image I used in this post was created by the world flag project “to raise awareness and funding for non-profits and individuals working in the areas of education, world health, human rights, and the environment.” I had chosen this flag since during these internet campaigns it is common for people to declare their allegiance to one side or another with a national flag, but I was unaware there was an organized project behind this fabulous image. What a post … the botnet thing is disturbing. 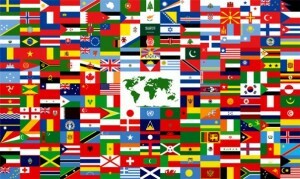 I like what you are talking about… Very interesting stuff… We at The World Flag would ask you to kindly place a link to our site to help us educate people about The Flag!! Using the Gentle Calm theme designed by Phu Ly. WordPress took 0.470 seconds to generate this XHTML page.